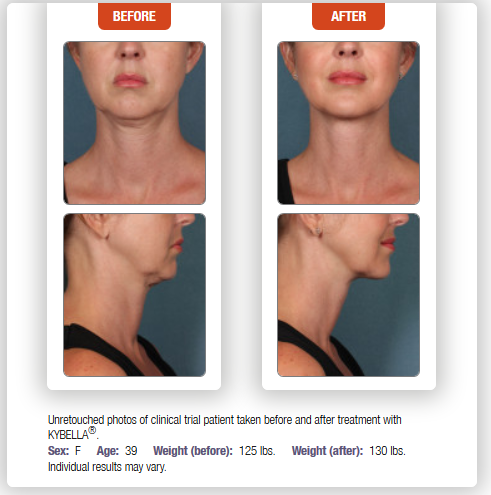 Chevy Chase Cosmetic Center is one of the few cosmetic centers in the DC metropolitan area to offer KYBELLA, the only FDA-approved non-surgical treatment to dissolve submental fat, known as a "turkey neck" or "double chin." KYBELLA® is a prescription medicine used in adults to improve the appearance and profile of moderate to severe fat below the chin. Are you ready to reduce your double chin with a fast and easy non-surgical procedure? Come in for a cosmetic consultation at Chevy Chase Cosmetic Center to see if Kybella is right for you. Call 240-482-2555 for an appointment in Chevy Chase or 301-345-7375 in Greenbelt today! You and our board-certified dermatologists here at Chevy Chase Cosmetic Center will customize your KYBELLA® treatment regimen, including how many treatments you need, based on your desired chin profile. Many patients experience visible results in 2 to 4 treatment sessions. During these sessions, our dermatologists will administer KYBELLA® into the fat under your chin using multiple injections. Up to 6 treatment sessions may be administered spaced no less than one month apart. Good news! 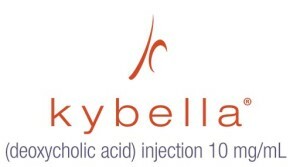 When injected into the fat under your chin, KYBELLA® causes the destruction of fat cells. Once destroyed, those cells cannot store or accumulate fat. After the aesthetic response is achieved, retreatment with KYBELLA® is not expected. The safety profile of KYBELLA® is well characterized. The most common side effects are swelling, bruising, pain, numbness, redness and areas of hardness around the treatment area. KYBELLA® is the first and only FDA-approved injectable drug that contours and improves the appearance of submental fullness known as a double chin or turkey neck. Come in for a cosmetic consultation with one of our physicians to see if KYBELLA® is right for you. Call 240-482-2555 for an appointment in Chevy Chase or 301-345-7375 for Greenbelt today!